Suzuki Kiitsu’s father was a dyer, which may explain the artist’s interest in color throughout his painting career. He was the student of Sakai Hōitsu (1761–1828), a Rinpa master who also studied Shijō and other painting styles. Kiitsu was Hōitsu’s primary assistant and established an eclectic style while working for the Sakai family, the lords of Himeji Castle. He also developed as an individual artist, his principal contributions to the evolution of Rinpa being his free use of tarashikomi and his carefully planned, proto-modernist compositions. Kiitsu occasionally abandoned his master’s style and created unique, semi-abstract paintings. Kiitsu displays his various skills in this pair of hanging scrolls. The morning glories and gourds, traditional seasonal imagery representative of summertime, are painted in opaque colors of bright blue and bluish green, respectively. 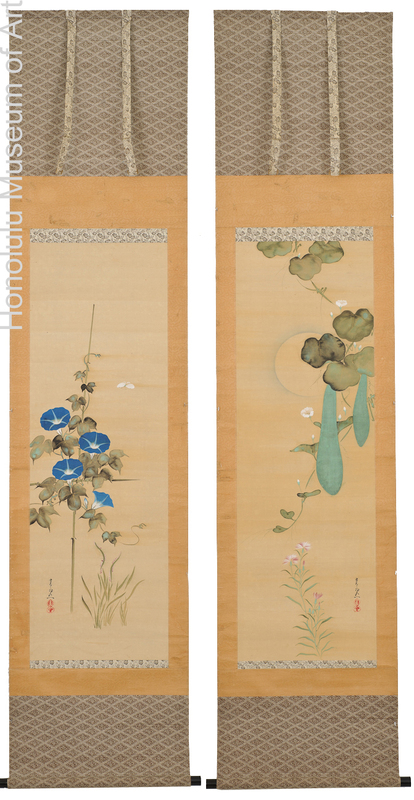 The blossoming morning glories appear to be the same form, slightly turned and repeated as they climb upward the stalk, demonstrative of Kiitsu’s aforementioned decorative and abstract style. This stands in contrast to the more expressive nature of the leaves surrounding both the morning glories and gourds, which are created in tarashikomi with mixed green and black colors. Side by side, the two compositions appear balanced and clean. The morning glories, situated in the lower left corner of the pair, nicely complement the gourds on the upper right. The backgrounds are left relatively simple: floral or grass elements appear at the bottom center of each painting, and the monochromatic moon peers from behind the gourd plant. An outline and an atmospheric light ink wash convey the appearance of the white moon, a strategy reminiscent of Kiitsu’s master Hōitsu. Miyeko Murase, Masterpieces of Japanese Screen Painting (New York: George Braziller, Inc.), 219. Motoaki Kōno, “Rinpa School,” An Enduring Vision: 17th to 20th Century Japanese Painting form the Gitter-Yelen Collection (New Orleans: New Orleans Museum of Art), 272. Toshinobu Yasumura, “Cuckoo under the Moon,” The Price Collection, (Tokyo:Shogakukan Inc.), 164.